Inscribed Triangle with the Minimum Perimeter. Orthic triangle. Problem 54: Angle bisector, circles Midpoint of arc. 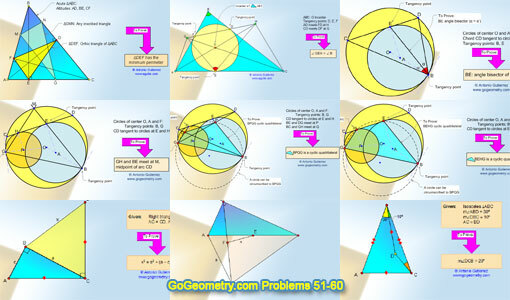 Problem 55: Angle bisector, circles Cyclic Quadrilateral. Problem 56: Angle bisector, circles Parallel Lines. Typography of Problem 56: circles, tangent, parallel lines. Problem 57: Angle bisector, circles Cyclic Quadrilateral. Problem 58: Right Triangle, Congruence, Perpendiculars. Problem 59: Right and Equilateral Triangles, Midpoints.